Too Smart for a Target Date Fund? A few months ago I was faced with a question that I had never thought about before: How should I be saving for retirement? I had just landed my first full time job and knew that I wanted to put away a good portion of my income for retirement. I just didn’t know how – or even how much. My benefits orientation on the first day at work was not much help. The only thing I learned was that the default investment for the company’s 401(k) contributions was a Fidelity Target Date fund. At the time I thought, “I’m way too educated to be investing in a target date fund.” In case you didn’t know, a target date fund is a mutual fund that automatically diversifies each share into stocks and bonds, and changes that mix (more bonds less stocks) as you get closer to your retirement. 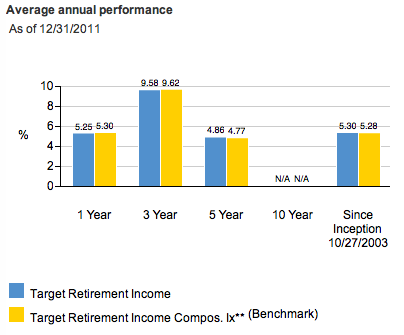 The simplicity and ease of investing in a target date fund seemed to good to be true. And so I embarked on a quest to find the smartest way to invest in my IRA. After a month, I had read 5 books and parts of many others. I read a bunch of articles, many sent to me by my girlfriend who knew I was frantically searching for answers. I even made a few of my own spreadsheets. The result of all this research? I bought shares in a target date fund. Part 1 – Individual Stocks and Retirement Portfolios: Investing in individual stocks takes too much time, causes stress because of the high stakes, and generally results in underperformance. I decide to never invest in individual stocks in my retirement portfolio. Part 2 – The Case Against Mutual funds: It turns out that mutual fund managers can’t beat the market either. I decide that I will buy index funds. Part 3 – Asset Allocation: A proper retirement portfolio will not have all its assets in just one index fund, it needs to be diversified. I decide on a proper asset allocation for my age and begin the search for the 10 index funds that will leave me properly allocated. Part 4 – Expense Ratios: There are many index funds that have the same holdings, but low expense ratios are what set the good ones apart. I find out just how important expense ratios are and pick out the index funds with the lowest cost to me. Part 5 – Account Fees and Commissions: Funds with low expense ratios aren’t so good if you have to pay a transaction fee or commission every time you buy one. I decide to find the cheapest broker and limit the number of purchases I make per year. Part 6 – Portfolio Rebalancing: Buying funds only once or twice a year causes you to miss out on the power of rebalancing and end up with a poor asset allocation while you are waiting to buy more funds. I decide to revisit target date funds. Part 7 – The Solution: I find out what holdings actually make up the target date funds and compare their expense ratios. It turns out that target date funds have many benefits over any other funding strategy: low transaction costs, low expense ratios, and low stress. I buy a target date fund. This is part one of seven in my attempt to explain how you should invest in your retirement portfolio. Click here for the introduction. Should I own individual stocks in my retirement account? In the Fall of 2007, I had just come off a bitterly disappointing fantasy baseball season. It was a season where I spent about 30 minutes a day researching stats and adjusting my roster. Every day I would look at each player to see what his batting average was against the opposing pitcher, if he was on a hot streak and or even if he was playing a day game or night game (some players hit better in the day). So when I came in third place, I felt like I had nothing to show for all the time and research that I had spent that season. Coincidentally, that semester in school I was introduced to the stock market for the first time and became fascinated with the idea of making money in stocks. I thought to myself, “If I spend as much time as I do on fantasy baseball on researching stocks, I might be able to actually make money instead of wasting my time looking at baseball stats.” And so I began investing in a discretionary (non-retirement) portfolio. As of today, my portfolio’s value has declined about 4 percent from its original value in 2008. This is not terrible considering many portfolios lost 1/3 of their value during the mortgage crisis that happened to occur at the same time, but it is also nothing to brag about. I still keep some money in this discretionary portfolio, but when I asked myself the question “Where should I put my retirement money?” I vowed to never own any individual stocks in my retirement portfolio. Here are the three questions I asked myself that got me to that conclusion. How much time do I want to spend on my retirement account every week? Believe it or not one of the best books I read on individual stock investing was Real Money by Jim Cramer. It was great at teaching the basics of how to analyze stocks and time the market by explaining things like price to earnings ratios and sector rotation. One of the most important lessons I learned from Cramer was that owning stocks was not about “buy and hold” but “buy and homework” – as he is famous for saying. He recommends that you do one hour of research per week for every stock you own, and that you need to own at least 5 stocks to have a diversified portfolio. That is five hours more than I want to spend thinking about my retirement account every week. If I spend the time, will it be enjoyable or stressful? All right, let’s say I did have the time and inclination to spend at least 5 hours a week doing research. That means that I’d be checking my stocks’ value once a day on the internet. I would be straining my ear if I heard something on the radio about the stock market and thinking of what it might mean for my retirement. Instead of flipping channels right past CNN I might actually want to hear what the talking heads are saying about the Federal Reserve and interest rates – and still have no idea if I should buy or sell some of my shares. I know for a fact that there will be surges of joy when my portfolio goes up 2% in value one day, and then instant depression if the portfolio’s value drops. To me it just sounds like stress. Especially when my ability to retire is on the line. How likely am I to get better returns than everyone else? Just for fun, I asked myself, what if I did have the time, and I didn’t mind the stress. What makes me think – as an individual investor researching 5 hours a week – that I am going to see greater returns than a MBA that does this for a living? Sure, there are always going to be a few people that made the right call and hit it big. And I will always have some friends telling me how good the market’s been to them (though I know they are probably lying). The fact of the matter is that the market is a zero sum game. The winners and losers must balance out. How can I be so sure that I’ll be on the winning side? As I later learned (and present in part 2), all the research indicates that underperformance is a much more likely scenario. I’m not trying to say that investing in individual stocks is always a bad idea. I am saying it’s a bad idea for a retirement portfolio. Its one thing if you make the wrong call in your discretionary portfolio and have to buy a 40 inch TV instead of the 60 inch 3D HDTV you’ve been saving for. But what if you make the wrong call in your retirement portfolio? The fact is, because the retirement nest egg is so important to your future security, buying and selling decisions have extra stress and extra importance. Having that extra stress for returns that aren’t even likely to beat the market hardly seemed worth it. Especially when I have to spend at least 5 hours a week. So If I don’t want to invest in individual stocks myself, where should I put my money? To continue reading, follow the link to Part 2 – The Case for Index Investing. This is part two of seven in my attempt to explain how you should invest in your retirement portfolio. Click here for part one. I knew I did not want to invest in individual stocks myself, but I still thought that picking the right stocks at the right time was the only way my retirement portfolio was going to grow. Personally, I was not confident that I would find an edge over other investors or even that I would be able to overcome the human tendency to want to sell low and buy high – the opposite of good trading. But I figured some savvy broker with a Harvard MBA would be able to. 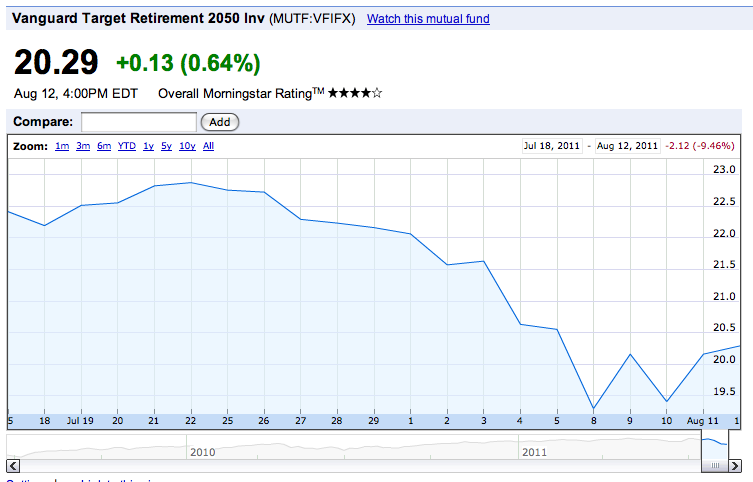 As a result I started looking into actively managed mutual funds. Mutual funds are an investment vehicle that pools money from individual investors and leaves it in the hands of the fund manager (the savvy MBA type). This fund manager’s only job is to make money for the investors in this fund. Usually he or she (most likely a he) will have a team of research assistants and all day they research stocks, bonds, commodities… you name it. If he has 3 assistants, that means the fund spends an average of 160 hours a week researching the market (compared to the 5 that I would devote to it). And that’s if they only work 8 hour days. In other words, mutual funds have the time and experience to make better investing decisions – and get better returns. Or so I thought. It turns out that buying mutual funds – a retirement solution that so many people rely on, is one of the worst investment vehicles for your retirement money. That is in part due to the fees and commissions that are associated with buying some funds (such as loads), but most importantly it is due to mutual funds under-performance relative to the market. The biggest fallacy in the finance industry today is notion that actively managed funds will outperform the market. What is “the Market?” When I say that most mutual funds fail to beat the market, what do I mean by “the market?” The market is an elusive term, but most often refers to the return you would get if you literally bought every stock listed on the S&P 500. The S&P 500 is an index made up of 500 stocks selected by Standard and Poors (S&P) to be an indicator of total US Stock performance. There are many other indexes designed to track the market performance – you’ve probably heard “The Dow” (Dow Jones Industrial) or “The Nasdaq” or even the Rusell 3000 quoted on news stations. They all represent different ways of measuring the market’s overall performance. The Russell 3000, for instance, is an index composed of the 3,000 largest US traded stocks. While all of the indexes mentioned above track essentially the same thing, the S&P 500 is often used as the standard benchmark for the performance of US stocks. Nowadays buying the market is possible because of index funds. An index fund is a type of mutual fund or ETF (Exchange Traded Funds – more on that in Part 3) that has a portfolio meant to exactly track a market index. For example, there is a S&P 500 index fund. That means when you buy this fund, its performance will exactly match the performance of the S&P 500, which will come pretty close to matching the entire performance of the US stock market. Index funds are considered a form of passive investing (as opposed to active investing) because the managers of index funds make no attempt to make money. The managers (probably just a computer program) simply aim to make sure the fund’s portfolio matches whatever index it is tracking. Because of the existence of index funds, achieving the same return as the market takes absolutely no skill whatsoever – since everyone can do it. As a result, the market returns have become the standard by which all active investing strategies and managers are measured. In other words, if you are a mutual fund manager and you buy and sell individual stocks all year, yet at the end you have under performed the market, you will look silly. You could have bought an index fund and sat back in your big comfy leather chair, done absolutely nothing, and would have generated better returns. Are Mutual Funds really that bad? If you are like me, you would expect that mutual funds would consistently beat the market, but it turns out that they don’t. One of the best books I read exposing this truth was The Power of Passive Investing, by Richard Ferri. 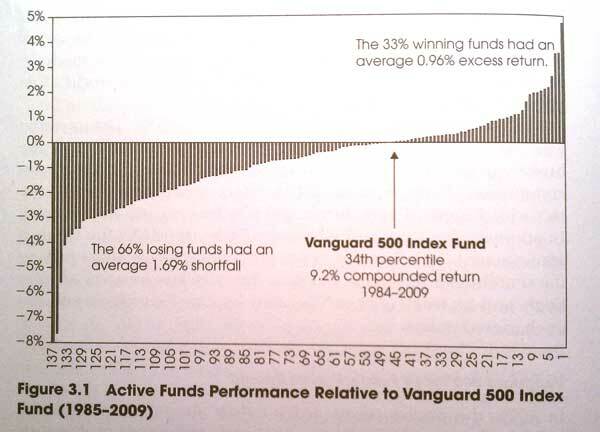 A main point that the book constantly drums into your head is that 2/3 of mutual funds fail to beat the market. Further more, the average underperformance from losing funds was more than double the outperformance of winning funds. I’ve stated it as simply as I can here. But let me assure you, there is an entire book full of independent studies to back this up. The image below is one of the most straightforward pieces of evidence in the book. It shows the performance of the 136 actively managed funds (that invested primarily in domestic equity and have been around for the past 25 years) compared to the S&P 500 index fund. There is no secret to the numbers, you can find the annual returns for each of these funds online. Why haven’t I heard this before? I know what you are thinking – “If this is true, then why haven’t I heard this before and why don’t more people know about it?” I thought the same thing. According to Ferri, the primary reason we flock to mutual funds is because of the massive amount of advertising that is done on their behalf. You see commercials for financial advisors and mutual funds, but you don’t see commercials for index funds. Most investment companies earn revenue by selling investment products and charging commissions or fees – two things you can’t charge an investor who simply buys index funds. Simply put, its hard to make money off of index funds, so the investment companies wont promote them. Mutual funds on the other hand, are a cash cow for many companies. But if the numbers are so terrible, how do they make mutual funds look so good in advertisments? First, they only tell you the mutual fund return independent of the fees and commissions you will have to pay (Average mutual fund fees can reduce your annual return by 2%!) What’s more is that advertisements only talk about the winning funds (which as shown above, actually represent the minority of funds). How many times have you heard about Fidelity’s Magellan fund? When I think of mutual funds, that’s what I think of, and it was one of the best performing funds of our time – consistently outperforming the market. Is it really that surprising that you’ve never heard marketing for a fund that underperforms? There are also a bunch of other tricks that advertisers use. They might compare their mutual fund’s performance to inappropriate benchmarks. An example might be a mutual fund that had a majority of its holdings in domestic stocks, but had 40% in emerging market funds. If emerging markets generated great returns and you compared that fund to the S&P 500 (a domestic stock index) it might look like you “beat the market,” when perhaps your emerging market stocks didn’t even beat the emerging market fund index. Another strategy for advertisers is to give you the line, “why would you want to subject your self to merely average returns when you could have better than average returns?” And they have a point. Investing in an index fund guarantees you will get average returns, and investing in a mutual fund could get you better returns. What they leave out is that getting better returns is not that likely. Though I was initially skeptical that mutual funds could be that bad, I ultimately couldn’t ignore the data from multiple sources that said the same thing. Two thirds of mutual funds fail to beat the market. So if you can’t beat the market with a mutual fund, then why not just buy the market? To continue reading, follow the link to Part 3 – Asset Allocation.